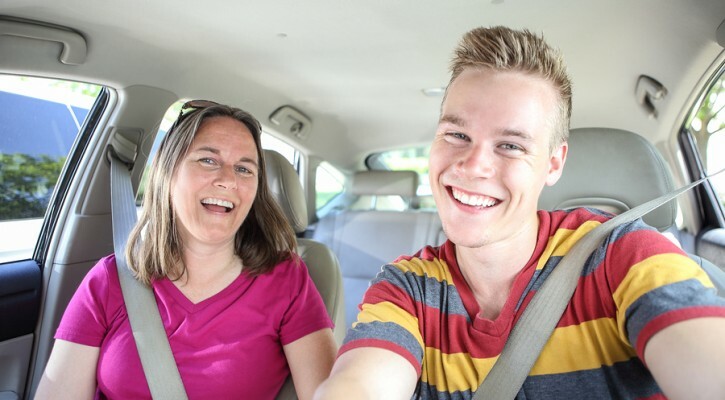 Teens drive better when mom comes along and they feel good about it too according to a study conducted by the Beckman Institute for Advanced Science and Technology, University of Illinois, Urbana – Champaign. In this novel study, 25 fourteen year old teens were each placed in an fMRI machine that allowed the researchers to view and record their brain activity while driving a computer simulated driving course. The fMRI machine shows blood flow to areas of the brain that are most active. The teens were paid for their participation but they were also told that, if they scored the fastest time, they would get more money. The course had 26 intersections and the timing of the lights and the presence of cross traffic varied so that the teens wouldn’t experience the same traffic patterns each time. If the teen stopped at a traffic light, it cost them three seconds added to their time. If they attempted to run a red light and were involved in a “crash,” it cost them 6 additional seconds. When teens drove alone, they were much more likely to try to make it through a yellow light before it turned red. If they made it through safely, without costing them any more time, the researchers were able to see more blood flow to the reward center of the brain. In other words, the teens felt good about their decision and you could witness that good feeling as it appeared in the brain. When the teens were told their mom was watching, the teens drove much more carefully and tended to stop when they encountered a yellow light. The strange thing is that, with mom “in the car,” the same reward area of the brain lit up when they drove safely. It appears that, if a parent is along, teens tend to take fewer chances and they actually feel rewarded by driving in a safe manner. Of course mom can’t be in the car at all times but there are systems that allow moms to look over their teen’s shoulder. There are a variety of apps and plug-in systems that report if the teen is driving aggressively, turn off the cell phone and inform the parents of the teen’s location. If only they could bake cookies too.